This series of meetings is brought to you by the Vista Chamber of Commerce. Join us on Friday September 2nd for our Business Breakfast Club. The Business Breakfast Club will be a Networking group that promotes, teaches, shares and practices “best practices” in Business. Debbra Sweet, author of “Leadership in Networking” will be the guest facilitator/teacher. 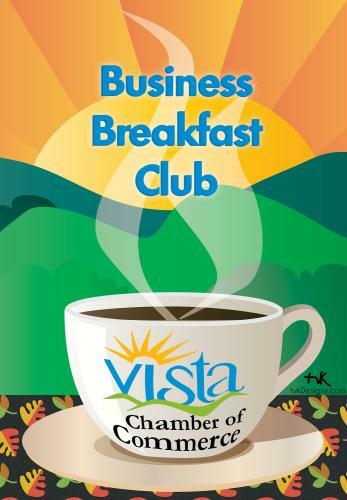 The Business Breakfast Club will meet every other Friday at 7:30 a.m. at the Sunrise Cafe in Vista. For more info about the Power of Leadership Books click here. Tuesday February 8, 2011 The voice of Power of Leadership, founder of Sweet Marketing Solutions, keynote speaker and New York Times best selling author, Debbra Sweet hit San Diego’s airwaves on the Brian Britt radio show. PRLog (Press Release) – Feb 13, 2011 – Debbra Sweet is no stranger behind a microphone. In fact, her years of experience as a music performance major, professional speaker and radio show host clearly comes through when she’s live on air speaking about subjects she is passionate about. On Tuesday, February 8, 2011, Debbra joined San Diego radio show host Brian Britt, on his new show called More Than Just About the Money. The Brian Britt Show: More than Just About the Money is a show whose promise to listeners is to enlighten, educate, and deliver high value content on wealth creation. One distinct aspect about this show is that it’s not just about the money. that the most successful and wealthiest people have a knowledge base and understanding that allows for work life balance. There needs to be balance and wealth in the area of health, thinking, leadership, spirituality, business management, communication, effective marketing, family, and leisure time. Debbra Sweet is a multifaceted entrepreneur who is known for being the founder of the national integrated marketing communications firm, located in San Diego, as well as being one of the lead authors in the Power of Leadership books as well as being the voice of the Power of Leadership radio. Brian talks with local author and speaker Debbra Sweet about her Power of Leadership book series. Learn how networking with a plan can produce results and bring business to your company. Find out how Debbra helps her clients gain visibility, credibility and profit. Brian and Debbra focused this show around one of the books in the power of leadership series called “The Power of Leadership in Business Networking.” This is book 4 in a series of 12 written by Debbra Sweet and her husband Daniel Sweet. “The Power of Leadership in Business Networking.” is a book filled with experiential insight not only on leadership as well as networking for the sake of doing business… but most importantly, the book teaches the reader how to be a leader when networking. This revolutionary concept has been helping business professionals around the world understand many of the nuances that a leader needs to address in every element of networking. Sweet also shares on the show with Brian that her belief in leadership is a bit controversial. Never one to shy away from asking tough questions, or taking an uncomfortable position on things-when it comes to the age old question of whether readers are born or whether they are made, the majority of people take the position that leaders are made. Sweet takes the position that leaders are born. On the show, she reveals why and then continues to deliver important insights to the listening audience on how they too can become empowered and be a leader today that truly does deliver results. This show originally aired on WSRadio.com and can be heard in archives by searching for the Brian Britt radio show. One of the first steps in creating a life of prosperity and abundance is the ability to identify what is available for you to receive. The universe is full of prosperity. It is full of abundance. It’s an infinite resource that never ends. It’s ongoing and available for us to receive. For anything to function effectively there needs to be some kind of structure. There are laws that govern our universe called Universal Laws. These laws apply to everything, everywhere at all times in our universe. These laws enable our universe to function in an orderly fashion. Without these laws there would be chaos in the universe. By studying, understanding, cooperating, and applying these Universal Laws in our daily lives we can lead the most successful, fulfilling, and abundant, joyful, prosperous and healthy life possible. The law of prosperity and abundance does indeed supply every possible need. It’s a law that applies to everyone. You have but to look around you and see the abundance. This however, is where opportunity presents itself for one to grow in understanding. Although the universe is filled with abundance and opportunity for prosperity, it is you who must accept the prosperity and abundance – and there are some principles to discern and understand to fully manifest them in your life. To manifest prosperity and abundance, one distinction to be clear about is the thinking process that is running your life. Are you creating a life that is based upon prosperity and abundance thinking- or upon a scarcity mindset? There is a universal law called The Law of Attraction. What you think about the most, you will attract into your life. The majority of the people in the world tend to run on a mindset of scarcity. It’s a mindset based upon a belief of limitations, rigidity, comfortable routines, and often the impressions of other people’s negative beliefs that feed into ones own thinking. This scarcity mindset is strong and prevalent. You see it in reality every time you turn on the news, read most newspapers and you can hear it in most people’s conversations. From our own words it can sound like “I can’t, I won’t, it’s no use, that’s too hard”. The news propounds scarcity thinking by talking about ‘how awful the economy is, the horrific things that people did that day, the newest disease, sickness or other destructive force that happened that week’- and much more. These are the thoughts and conversations that turn into tabloid sensations and perpetuate the scarcity mindset circle. When you hear it one day, it becomes idle chatter and water cooler gossip the next! Some people live their whole lives around the news of others. 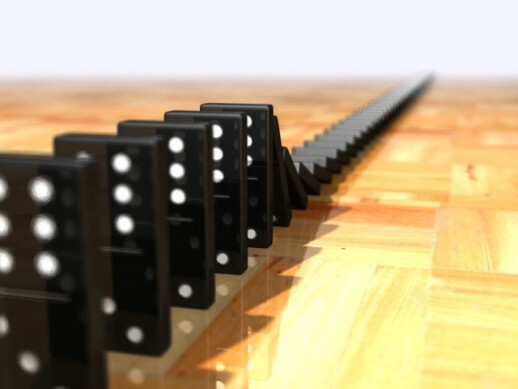 The sensationalism of such stories is hard to resist- but resist is what you must do – if you truly want abundance and prosperity in your life. The problem with having your thoughts running on scarcity thinking for so long– is that those thoughts and beliefs are comfortable and at home in your conscious and subconscious mind. They’re like a favorite pair of worn in sweats or slippers. When you slip into them you just say ‘aahhh’! It feels good- its familiar…it’s safe. When you decide to change your thinking – you will begin to shift your belief system. It may not be comfortable or familiar territory but it is very rewarding when you achieve. Where you want to manifest prosperity and abundance, you need to undo what has already been programmed in your thinking. You need to undo scarcity thinking. To do this, it starts with making the decision to change. Then, you follow it up with action. Part of the action you need to take to begin manifesting abundance is to identify what new information you need in order to ‘reprogram’ your thinking. One element in understanding how to live abundantly is to know what is available. Are you looking for prosperity in health, finances, relationships, work, rest, emotional abundance, spiritual abundance or even material abundance? This is the easy part. Most of these elements that people equate to abundant living can be seen around us. All you have to do is look. Once you determine what areas you want abundance in, then you can fine tune the details as to what is really available. This is the first step. Prosperity is yours to receive- jut follow the path it leads to you. Stay tuned and have a prosperous day! Have you ever really stopped to consider how your actions dictate your life? For some, this may not be a new concept. For others, it may be the first time they’ve ever heard that. It took me sometime as I was growing up, to harness the power of that statement. It’s simple. It’s seems somewhat easy to grasp- but to understand the true magnitude behind it- you need to take a few moments to ponder just how deep and impactful those three words can really be in your life. Many people go about their daily lives with minimal intention in what they do. In fact, most have no intention. 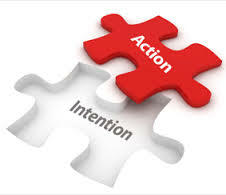 The definition of intention is: quality of purposefulness, or, the quality or state of having a purpose in mind. It’s about having a purpose, a reason, a focus that leads to a desired outcome. If you wake up in the morning simply to roll out of bed, jump in the shower and maybe get to work on time to do the ‘daily grind’, there may not be much intention -other than showing up so you can have a paycheck. For the person who, upon rising, has a plan for the day, they’ve set a desired idea or goal that they would like to see happen- that person has taken a step to lead their thoughts and actions with intention. The thought, goal or idea is not the intention in and of itself. It’s the desired end result. It’s really important to have an end desired result first if you’re going to achieve things in your life. Once you have that end result in thought, you have created the end goal- and now, you focus on the game plan to make that goal happen. Here’s where action with intention really kicks in. You have to keep your eye on the goal at all times. Think it, feel it, breathe it, smell it- embrace it as is you already have it! Once you’ve got that, everything you do now has a purpose. It’s either going to support your goal, dream or idea- or it will distract you from it. Once you become aware of your actions, whether they are conscious or subconscious choices, you can start to monitor the things you do. You can start to really create a life of abundance if you choose actions with intention that will open doors and bring people into your life that will support you along the way of reaching your goals. You can also start to make active decisions that will intentionally eliminate distractions, naysayer’s, and non- supporters in your life. Action with Intention is powerful. It’s a key factor in helping you live the life you’ve always wanted. Remember: when you start to apply this in your life is it requires one main thing: ACTION. The choice to take no action to make changes – is actually an action in and of itself. Your choice and intention behind it is to take no action. When you choose to embrace this concept and manifest positive actions and intentions- be ready to be blown away at the world that opens up to you! Enjoy your day – and make each action intentional! Sometimes when people meet me and speak to me they comment on my positive attitude and passion for the things I do. It’s consistent and it’s strong. I’ve always considered myself an ‘eternal optimist’, but saying that and getting to the point where you live it (positive thinking with passion ) everyday can be two different things- and mine didn’t come without having to overcome some serious obstacles in my life. There are situations when you describe someone as being a ‘cup half empty’ or a ‘cup half full’ kind of person. I would be the ‘cup half full’. I have always had an innate ability to see opportunity where others didn’t. I’ve also seen beyond the facades that most people put up to the public and see potential in people when they can’t see it themselves. Taking all of this into consideration- in order for me to get to the point where I am today with my thinking (being very focused, consistently positive and intentional in my thoughts and actions) – I had to overcome some very deep, dark times in my life. I have always seen potential in others- but it was a big accomplishment to see it and believe it in myself. I usually didn’t have someone there to get through the darkest of those times. Along the way, occasionally, there were a few people who stood by my side – and to you I am very grateful for your vision in me to be more than what I could see at that moment. Your support and actions are not forgotten – and never will be. Most of the time though- I had to get through the struggles in my life and the ‘stuff in my head’ – on my own. There was no internet with ready information at my fingertips to answer my questions of ‘why’ and there was very little understanding of how our thoughts dictate and impact our life. Today we understand more about that but not everyone ‘gets’ it. It may seem unusual to meet someone who is grounded with genuine care about others and has a great attitude. I am one of those people. Keep in mind though, that underneath it all, I’m still human and do have a full range of emotions. I’ve come from places and situations that I would never want to have others go through. I thank God everyday for keeping the dreams and visions he gave me for my life burning and alive through it all. Part of my journey and my rise from darkness is an understanding of how to create the positive things in my life I want. It’s part of my destiny to help and show to others along the way that they don’t have to stay where they are if they genuinely want more. Where this leads to is: every day, and in every situation we are faced with an opportunity to make choices. Each choice leads to the next path in our road. Your choices lead to habits and your habits create results. This can be good or bad. The choice is always yours. To get to the point where you make the choices that lead you down the road you want, you need to be willing to let go and move beyond the ‘reasons’ and the ‘stories’ that hold you where you are today. One needs balance in life- and acceptance and understanding that a range of emotions (which provide momentum to our choices) is healthy. The right choices with the right emotion behind them will help you get to where you want to go in life. Learning that you really do have a choice in how you want to live your life is the first step to achieving your dreams. Understanding what choices are right for you comes with time. When you meet someone who is focused and positive, you may not always grasp the opportunity that has opened up for you. You may choose to run from it because you’re unfamiliar or uncomfortable around that type of thinking – or you can make the choice to learn from it- to embrace it and move forward. I encourage you each day- consider the choices you are making. Are they reactive and out of a protective habit that keeps you in a survival mode? Or, are they intentional and grounded with a focused result in mind? The habit of choice starts with recognizing this: you do have a choice! Choose to survive – or choose to thrive. Your future is up to you.